‘The Army Mascot’ is the first of two World War Two cartoons starring Pluto (the other one being ‘Private Pluto‘ from 1943). Pluto never gets really involved in the war, though, he only joins the army. He was the second Disney character to do so, following Donald Duck, who had been drafted only three weeks earlier, in ‘Donald Gets Drafted‘. However, Pluto’s reasons to join the army are doubtful, to say the least: only when he sees the enormous portions of meat an army mascot gets, he wants to be one, too. He tries to replace “Gunther Goat”, mascot of the Yoo-hoo Division, but all he gets is cans. In his second attempt he tries to chew tobacco like Gunther can, to impress the soldiers. But Gunther makes Pluto swallow the whole piece, making him sick. 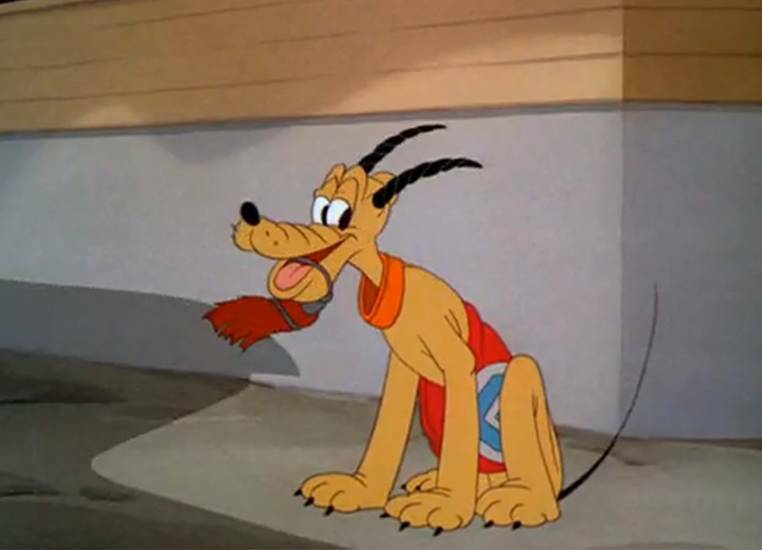 This sequence is the highlight of the cartoon, as Pluto’s sickness is animated in the most ridiculous way. Gunther then tries to finish his rival off by bumping Pluto into the munition depot, but it’s Gunther himself who bumps into the depot, which explodes, blasting the wicked goat up into the air, where he’s caught by a plane and carried away into the distance. Now Pluto takes Gunther’s place, and gets his steak after all. ‘The Army Mascot’ is a rather odd cartoon, where both main characters show unpleasant behavior: Pluto envy and trickery and Gunther haughtiness and wrath. Thus, ‘The Army Mascot’, although war-themed, can hardly be called a patriotic film.